About 34 minutes after liftoff, the shiny silver satellite was successfully deployed. Staff in the control room cheered and clapped.Earlier, boisterous spectators chanted along with the launch announcer who counted down the final 10 seconds before liftoff. The rocket carried a Saudi Arabian satellite operated by Arabsat, a year after sending SpaceX founder Elon Musk’s slick red Tesla roadster into orbitas a test. 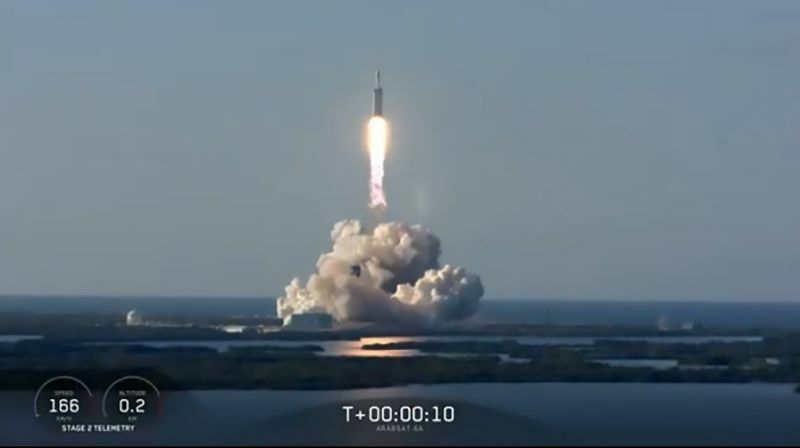 The satellite is designed to provide television, internet, telephone, and secure communications to customers in the Middle East.Less than 10 minutes into the flight, the rocket’s three boosters detached from the Falcon Heavy on schedule. Two of them, as planned, landed safely back on pads at Cape Canaveral, to aroar of approval from the crowd. It was quite a spectacle, with the boosters coming down gently, and vertically, fiery end first. SpaceX has two operational rockets: the Falcon 9, which with 21 launches in2018 dominates the US market, and the Falcon Heavy, which as its name suggests is designed to lift much heavier payloads into more distant orbits.